5793 labyrinths found. Showing 5761-5780. Sorted by country, state, city, then zip/postal code. 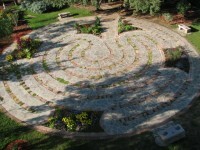 The labyrinth is located just south of the church. Currently the labyrinth is open dawn to dusk. Please take extra precautions during wet or snowy weather. Amoco Park, 1155 W. 1st St. 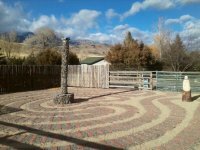 The labyrinth is within Amoco Park on the west side of the sidewalk that winds through the center towards the Platte River Trail and The North Platte River. The labyrinth is a five circuit contemporary version of a medieval form. The concrete is inlaid with colored glass reflecting the colors of the Wyoming sky and the beautiful river. Glow in the dark resins create a completely different day and night effect, both very pleasing to the senses. Elliott & James Ramage, Mike Miller, Rachel McBride, Mike & Amber Olson, Jason Eggemeyer, Art Boatright, John Griffith. The Cheyenne Botanic Gardens is located in Lions Park, just east of Frontier Days Park, north of downtown and easily accessed from Interstate 25 or Interstate 80. Visit our website for a road map of how to get to the Gardens. Upon arrival a map of our grounds is available inside the conservatory at the front reception desk. After hours just cross the periwinkle bridge, go past the Peace Garden, through the moon arch and the path will lead you to the labyrinth. 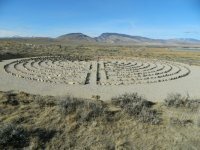 The labyrinth path is 1/4 mile from the mouth to the center and back. A fusion of classical and medieval elements, with planting areas separating the turns. 34 Thomas the Apostle Rd. Lazy DW Ranch, 30 miles outside of Cody, WY. Please note the labyrinth may be covered with snow in the winter months. The labyrinth is located on the east side of the church. Open from 7am to 6pm. Open later during the summer. The property is situated on Route 81 at 15km, Aquas Blancas, halfway between Route 8 and Route 60. Near Minas in the Minas hills. 55 27'0"E° Lat. ; 34 31'0"S° Long. In the activities of Opus Philosophicae Initiationis. 202 Huang Van Thu, ward 9, Phu Nhuan Dist. Set in the 18th century stone sugar plantation ruins. Surround by palms, banana plants and tropical jungle growth.